The inventors of modern Kernmantle rope have done it again. Pushing the boundaries, Edelrid has made a half and twin rated rope that is only 7.9mm in diameter. Great for climbing, rappelling, glacier travel, you name it. The new Apus rope is treated with all the standard Edelrid processes that make their ropes easy to handle and withstand the test of time. Simply a great rope for alpine adventures from a company that has been making them for 150 years. Yes, that’s right, 150 years of rope-making experience. Rated for 8 falls as a double rope and more than 30 falls when used as a twin. Treated with Pro Shield and Dry Shield for dirt and water resistance. Standard Thermo Shield treatment give the signature Edelrid feel. Made in Germany with a bluesign eco-friendly process like all Edelrid ropes. Weighs just 42 grams per meter. Is the Edelrid Apus Pro Line Climbing Rope - 7.9mm, 60m a Static Rope ? Hi Rick, no the Apus is dynamic line, rated as a double or twin rope. For ski mountaineering, hiking, and rock and ice climbing, which light rope should I choose? Hi Arnaud. If you're doing any single rope climbing you'll want a rope rated for that. The lightest is a tie between the Mammut Serenity 8.7 and Edelrid Corbie 8.6, both of which are triple rated for use as a single rope, double, or twin. The Apus is officially a double or twin rope, but can accomplish a lot of basic skimo tasks. I bring one of these whenever I anticipate having to do rappels when soloing rock or ice, but don't necessarily need a lead line. 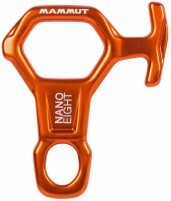 Most recently I used it as a single rope (I know) on the Direct Exum Ridge this past July. Come to think of it, my rope been up the grand twice in the past year and a half. Light, skinny, and dynamic. Not much experience with durability, but it doesn't have any wear from belaying and simul-climbing a few thousand feet of rock, and several long rappels, so I have no complaints. Also, I believe the diameter is misstated in the title - the Apus is a 7.8mm rope. FYI Christopher, the Apus is officially listed at 7.9 this season. Didn't actually measure but the packaging is pretty convincing.